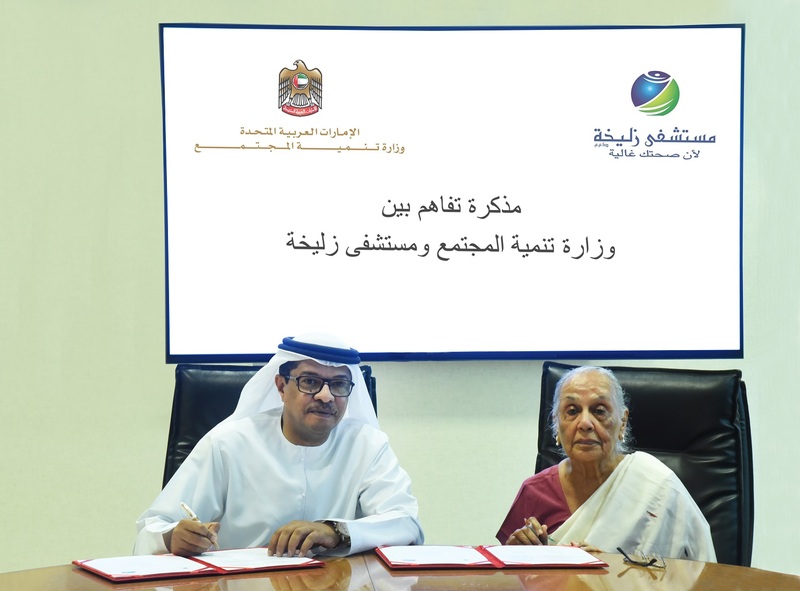 DUBAI, 27th May, 2018 (WAM) -- The Ministry of Community Development has signed a Memorandum of Understanding, MoU, with Zulekha Hospital to provide a wide range of discounted services and treatments for Emirati senior citizens who hold a Masarrah card. The card is a community card launched in 2016 to give Emirati citizens aged 60 and above access to a number of services and exclusive privileges. The agreement was signed by Naji Al-Hai, Assistant Under-Secretary for the Social Development Sector at the Ministry of Community Development, and Dr. Zulekha Daud, Founder and Chairperson of the hospital. Under the MoU, the hospital is committed to offering 30 percent discounts on medical, laboratory, X-ray, outpatient and physiotherapy services for Masarrah Card holders, as well as a dedicated clinic that ensures comprehensive care and quick service. The MoU will also provide a staff to accompany every patient, and Arabic, English and Urdu translators. The agreement will provide low cost treatment services and soft facilities for card holders, as well as social responsibility programmes between the two parties will be activated to promote the values of social solidarity and mutual benefit in common areas. Commenting on the MoU, Al-Hai said, "The signing of this MoU stems from the ministry’s eagerness to consolidate the concept of strategic partnerships with different sectors, serving all segments of the society and raising the level of services provided to them, especially the elderly." "The Ministry of Community Development is committed to intensifying our relations and cooperation with various bodies and institutions in various fields to achieve the UAE vision 2021 through continuous and comprehensive support of Emirati families with effective initiatives that support the national agenda goals in community cohesion and integration of all segments of society," he added. In turn, Dr. Daud said, "We are pleased to cooperate with the Ministry of Community Development to provide our medical services to the elderly at reduced prices. Our goal is to provide health care at an affordable cost to those who need it."